Passengers are welcome to board our ship at 5:00 p.m. After comfortably settling into your cabins, we'll introduce our crew at a welcome cocktail before dinner. 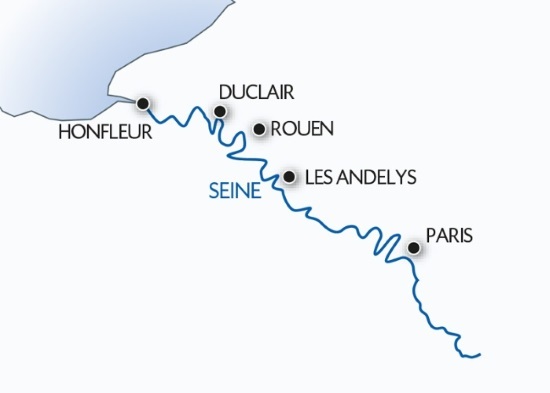 The morning will be spent cruising on the Seine, reaching Les Andelys in the afternoon. Join us for an excursion to Martainville Château. Tonight is our Christmas Eve dinner and evening. Midnight mass will be celebrated in Rouen(1-2). We'll cruise towards Honfleur. Join us for a guided tour of Honfleur, the most picturesque of the fishing ports. We'll spend the night cruising towards Rouen. Join us for a guided tour of Rouen. During this tour we'll discover the wonderful cathedral, historic districts, and the historic Market Square where Joan of Arc was burned at the stake. The afternoon will be spent cruising to Paris. Tonight is our gala dinner and evening. We'll arrive in Paris early in the morning. Enjoy one last buffet breakfast on board before disembarking at 9:00 a.m. End of our services. (1) Excursion by coach from Duclair. (2) Transfer is only proposed when the boat is not moored near the place of worship and is only valid for a minimum of 30 people.